“UFC on Versus 6: Cruz vs. Johnson” takes place Saturday inside the Verizon Center in Washington, D.C. The first preliminary bout is scheduled to start at approximately 5:40PM ET/2:40PM PT. Make sure to stay with 5thRound.com all night for our live coverage. Facebook will kick off the festivities with six preliminary bouts. Fanboys simply have to “Like” the UFC’s Facebook page in order to watch the scraps live. Versus will broadcast the main card immediately following the stream at 9PM ET/6PM PT. 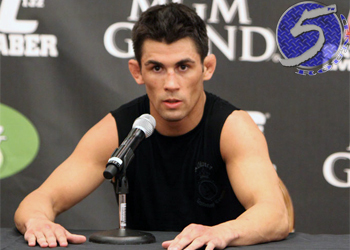 Saturday’s show will feature a bantamweight title tilt between champion Dominick Cruz (Pictured) and Demetrious Johnson. Cruz is a significant 4.5-to-1 favorite to retain his crown. A heavyweight shootout with Pat Barry and Stefan Struve will serve as the night’s co-main event.